The United Arab Emirates (UAE) is a country with paradoxical contrasts. Indeed, while its seven emirates are rooted in Islamic traditions, the country is still host to veritable influences. While Ajman & Umm Al Quwain provide glimpses of the country’s pre-oil days, Abu Dhabi, the UAE capital, and Dubai play hosts as glamorous playgrounds for tourists and non-Muslims alike. Despite its profound traditions, the UAE has opened its arms and doors to a mosaic of culture, providing some truly world-class experiences. Dubai establishes itself as an indefatigable city full of culture, class, and nocturnal action. It is a city not afraid of ambition, one forever on the lookout for a good time. Dubai is a city that demands attention, its malls are unrivaled, and the lively nightlife and hotels are grander and unashamedly glitzy. Its sheer amount of glass and steel can be seen as an oasis sprouting up from the desert. But for others, this may be an overwhelming experience. For those seeking a reprieve from the overwhelming buzz of the city, many of Dubai’s high-rise watering holes offer refuge. But be forewarned: To drink within the city’s walls, and within any of six emirates, as Sharjah is a dry emirate, a non-Muslim resident requires a Dubai liquor license. Tourists, on the other hand, do not require a liquor license as most licensed bars are situated within hotels. With all that said, head up to the clouds and take a tour of some of the city’s best sky-high venues. From Burj Khalifa’s dizzying heights to a Japanese-inspired cocktail lounge under the stars, drink in the views, and more importantly, the alchemic cocktails. 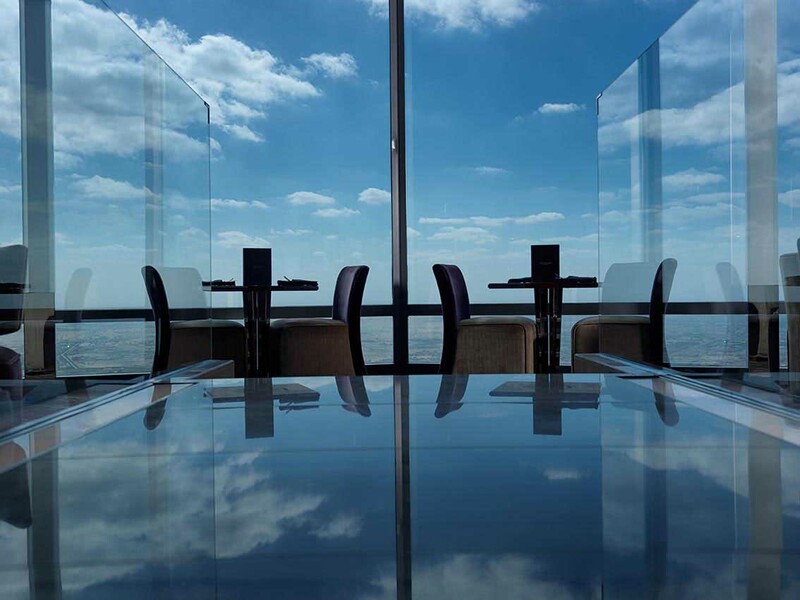 Offering stunning views of the bustling Sheikh Zayed Road below, this sleek and stylish sky lounge, sitting 43 floors up, provides its guests unrestricted panoramic views of Dubai’s skyline. On a perfect day, Level 43 offers its guests breathtaking views of Burj Khalifa, Dubai Mall, and the Jumeirah coast. By day, Level 43 Sky Lounge is a pool bar. At night, it transforms into a swanky lounge offering its visitors cocktails, mocktails, and more on its menu. With indoor dining seats and an outdoor lounge setting, this relaxed but upscale venue is the perfect place to unwind. Level 43 features an in-house music stylist, setting the perfect tone for ladies’ night and happy hour. Equivoque of its picturesque setting and elite clientele, Uptown Bar is style and sophistication. 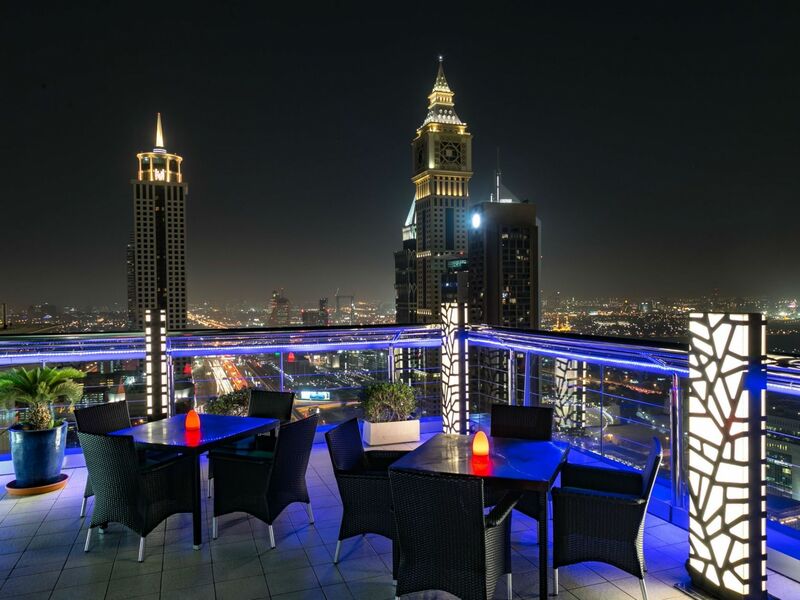 On the 24th Floor, Uptown Bar is a spacious terrace that offers one of Dubai’s most spectacular views. Whether your preference is for free-flowing bubbly, vintage grapes of traditional spirits like cognac, whiskey, or gin, Uptown Bar’s complex beverage menu means guests are spoiled for choice. Like Uptown Bar, 360° is a Dubai institution. Reflective of its namesake, 360° boasts the best views in Dubai, featuring panoramas of the iconic seven-star Burj Al Arab and sweeping waters of the Persian Gulf. Its Pan-Asian seafood à la carte menu is only rivaled by its curated cocktail menu, featuring popular favorites and homegrown creations. An effortlessly cool lounge, 360° is chic and sophisticated, an oasis of calm that transforms into an energetic and trendy hotspot for residents and visitors alike. The crown jewel of The Oberoi Dubai, Iris Dubai is the perfect oasis amid Dubai’s concrete jungle. 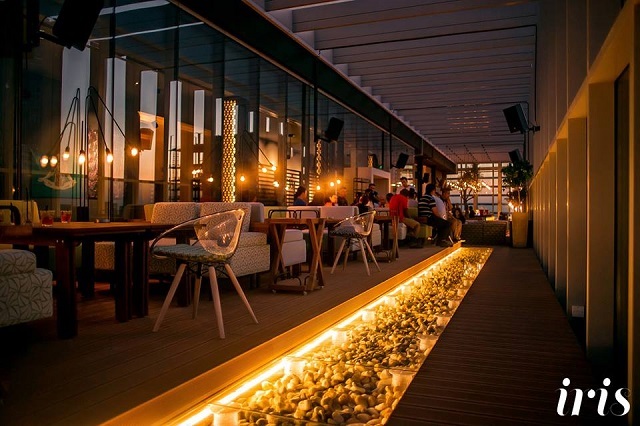 Located on the 27th floor, Iris Dubai is a tropical yet modern gateway, a sizeable Beirut-inspired rooftop bar. Its casual and relaxed vibe is a stark contrast to its location with Dubai’s Business Bay. Yet, this chic bar embellishes the concept of al fresco dining: mellow, charming and particularly welcoming. The drinks selection is extensive and the live acoustic sessions include a track list that encourages sing-alongs. Establishing itself as one of Dubai’s premier Japanese restaurants and bars, Tomo has been a crowd favorite since it debuted back in 2013. As its literal translation from Japanese means “a long time friend,” Tomo is a place where good friends gather. Helmed by Chef Chitoshi Takahashi, Tomo delivers authentic Japanese dishes which are beautifully complemented by the restaurant’s wide variety of sake and shochu, a distilled Japanese spirit. The indoor setting features traditional Japanese fixtures while its outdoor lounge, the Tomo Views bar, offers stunning sight lines of the city scape. Atop the tallest building on earth, one that looms audaciously over its city sits the peak of fine dining, At.mosphere. Rising 442 meters from the ground, its unrestricted views of the city’s skyline is only rivaled by its exquisite array of gastronomical wonders and innovative cocktail menu. The bar excites your palate with delightful new creations while the panoramic views bring an exceptional lounge experience. Come for a sundowner. The splendor of changing hues as the sun fades away and twilight beckons are worth the trip alone. Located in the most ostentatious hotel in the world, Skyview Bar in the 7-star Burj Al Arab is a lavish hideaway and the perfect setting to quench your thirst. While the journey up to the 27th floor is decisive and finished within seconds, the bar itself takes a gentler approach. The experienced mixologists at Skyview Bar go to great lengths to impress, offering a variety of cocktails from modern day classics to innovative experiences. The only thing that may catch your eye more than the floor-to-ceiling views of Dubai’s skyline would be the 7-star cocktails made to suit your taste and mood. The best views of any city are from a high, vantage viewing point. The few flights closer to the sun celebrate some of the most memorable views that a city has to offer. Dubai is no exception to the phenomenon. From atop one of Dubai’s palatial rooftop bars, the city below awaits with magical silence.